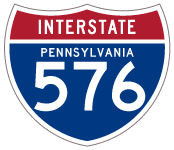 PA Turnpike 576 is the designation for the planned Southern Beltway, a semi-circular loop for the metropolitan area of Pittsburgh. The Findley Connector, angling southwest from I-376 and Pittsburgh International Airport (PIT) to U.S. 22, represents the western segment of the 89-mile limited access highway system. PA Turnpike 576 extends six miles and uses all electronic toll collection. Developed by the Pennsylvania Turnpike Commission (PTC), the Southern Beltway consists of three project areas. The passage of Act 89 in 2013 provided funding for the next stages of the Southern Beltway. The middle section of the Southern Beltway stretches 13 miles east from U.S. 22 and the Findley Connector to Interstate 79 near the Allegheny/Washington County line. A Record of Decision for this segment was issued in September 2008. Estimated to cost $800 million, work is divided into nine sections for the project. A limited opening of the middle section is scheduled fo Fall 2021, with connections at I-79 completed in 2022. Constructed between February 2014 and August 2015, Section 55A1-1 built a pair of 4-span steel multi-girder bridges across both U.S. 22 and Steubenville Pike. Section 55A1 constructs four miles of roadway extending east from U.S. 22 and the Findley Connector to Beech Holly Road. Work started on December 15, 2016 and runs through mid 2019. Section 55A2, underway from December 2018 to mid 2021, adds the next 2.7 mile stretch east to McDonald. It includes a connector road and interchange (Exit 11) joining the Southern Beltway with Pennsylvania 980 (Robinson Highway). Section 55B, approximately 3.2 miles in length, includes the construction of a 1,370 foot long span over Pennsylvania 980. Work on this project started February 16, 2017 and concludes in Summer 2019. Section 55C1-1, underway from November 2017 to mid 2020, extends two miles from Section 55B and includes a diamond interchange (Exit 15) with Cecil Sturgeon Road. Sections 55C1-2 and 55C2-2, started on October 3 and April 5, 2018 respectively, realigns Morgan Road and Hickory Grade Road along a two mile section of PA Turnpike 576. Running through mid 2020, both projects precede construction of the future interchange with Interstate 79 (Section 55C2-1). 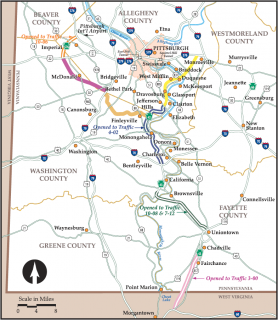 A Record of Decision for the 12.5 mile section of the Southern Beltway east from I-79 at Bethel Park to the Mon/Fayette Expressway at Finleyville was issued in May 2009. Final design, right of way acquisition and construction will proceed once funding becomes available for the Pennsylvania Turnpike Commission. Pennsylvania Turnpike 576 is part of High Priority Corridor 31: Mon-Fayette Expressway and Southern Beltway for its entire length. PA Turnpike 576 concludes at a three-level interchange with U.S. 22 in Robinson Township. The western end of the Southern Beltway is located at Interstate 376 and Airport Boulevard at Pittsburgh International Airport (PIT). “Findlay Connector to open access to prime acreage.” Pittsburgh Post-Gazette, November 13, 2003. Southern Beltway Projects – I-376 to U.S. Route 22. Pennsylvania Turnpike Commission (PTC) project web site. Page updated January 24, 2019.